A daily habit of excellence can create miracles. Mike arrived from Croatia to make wine more than 50 years ago. More than 50 years. I arrived in the Napa Valley on August 15, 1958 to work for Souverain Cellars. My family in Croatia always made wine. In fact, my mother switched me from breast milk to wine mixed with water when I was around 3 years old. Later, I studied enology and viticulture at the University of Zagreb but I had to leave Croatia because the Communists were in charge. Lee Stewart was a true artist. He did everything himself and I learned to do everything in the cellar the correct, precise way. André Tchelistcheff was by far the most knowledgeable winemaker in California when I arrived in 1958, and he was a great mentor to me. Robert Mondavi brought new thinking, new equipment and tremendous energy to Napa Valley winemaking. It is no accident that both winemakers that won at the 1976 Paris Tasting, Warren Winiarski and I, worked for Robert. 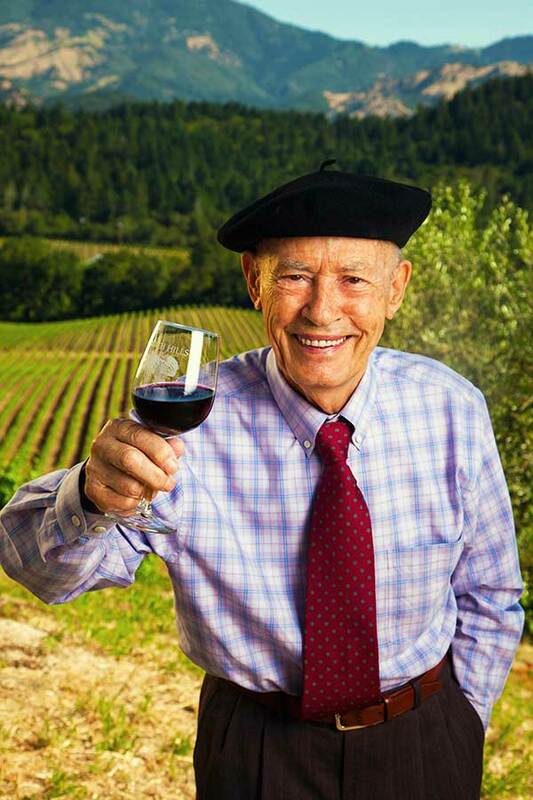 He saw the true potential for Napa Valley and he was a tireless promoter. I find it very rewarding to make something that gives people so much pleasure and joy. I’m also grateful to have my daughter, Violet, work with me and continue with the next generation. The valley has attracted a diverse group of vintners and workers who are the best in the world. We have winemakers who have PhDs and we have winemakers who learned from their fathers. We have several generations who grew up in Napa and we have immigrants like myself who came here for the freedom to make the best wine in the world. We are environmentally sustainable in that we farm organically to preserve and improve Mother Earth for future generations. We are economically sustainable. In 2006 we converted the entire winery to solar power, with a savings of around $75,000 per year. We are socially sustainable. We support many local charitable organizations such as Auction Napa Valley, Hospice of Napa Valley and we are longtime supporters of Roots of Peace, which is dedicated to removing land mines in many countries. I was the winemaker who made the 1973 Chateau Montelena Chardonnay that won the 1976 Paris Tasting. When I started my own winery, the first Chardonnay that I made under Grgich Hills beat 221 Chardonnays to earn the top award at the 1980 Great Chicago Chardonnay Showdown.